Use the Search box to search Law Portal collections by keywords or phrases. The Law Portal Search box includes a drop-down to select a collection to search. The collection that you are currently viewing will be selected by default. Each collection of the Virginia Law Portal can be searched independently, or you can select “All” to search all the collections together. 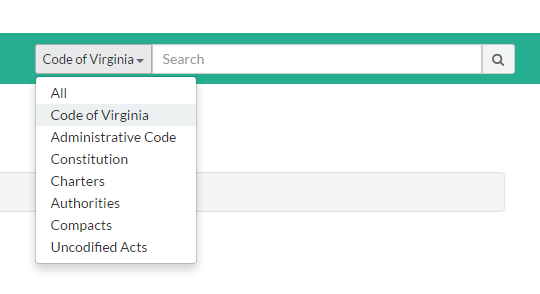 When you search the Code of Virginia or the Virginia Administrative Code, results are sorted by relevance. With these collections, you also have the ability to sort results by section order by using the “Sort by” dropdown menu. This option is located in the top right corner of the search results page. You will see filtering options on the left-hand side of the search results page. The options available depend on the collection being searched. Click on a filtering option to only show results that match the filter. When you click through to a search result, the search term that you entered will appear highlighted on the page. The Code of Virginia, as established back in 1950 has been revised many, many times. Old code titles, (e.g., Title 2.1) have been re-written or re-codified and are now newly numbered. (e.g., Title 2.1 is now numbered Title 2.2). If you cannot find the code section reference with the Section look up box, enter the section number in the Search box to see if the reference to the old section appears in the history of the new section.